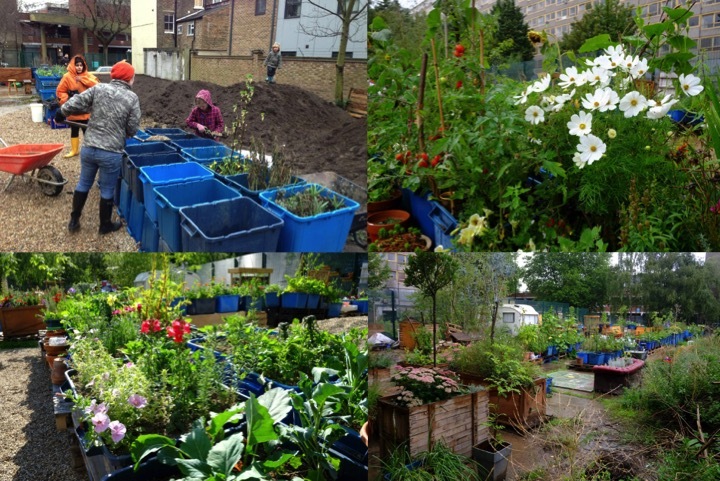 Mobile Gardeners is a volunteer led community gardening project in Elephant and Castle, London. 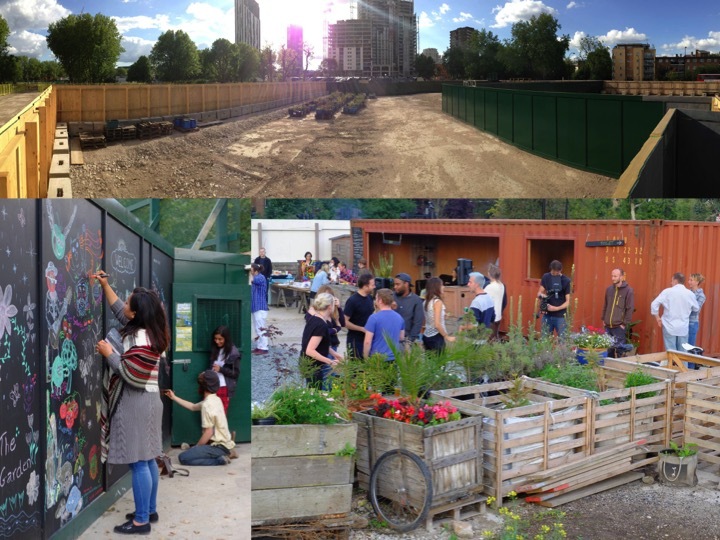 Between 2012 and 2016 we created four temporary community gardens, took on restoration and care of one pocket park and worked with residents within the grounds of six estates. 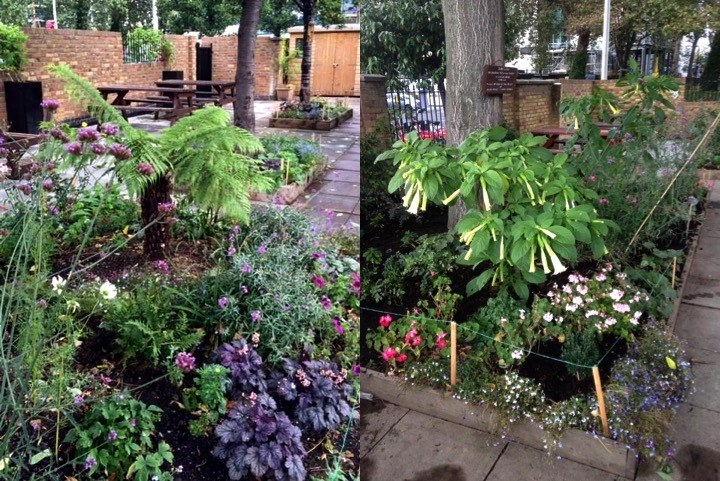 The present focus is supporting residents of the Hayles Estate caring for Elliott's Row Pocket Park. This website is an archive summary of projects. Please visit the social media pages for more information and topical relevant posts. 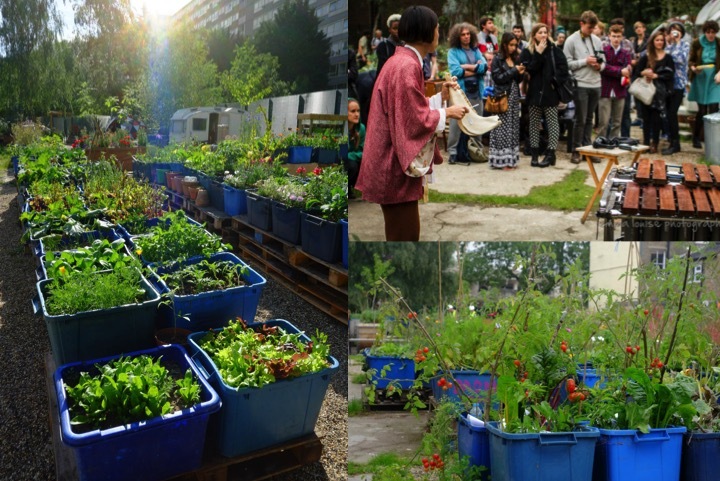 Mobile Gardeners was created in autumn 2011 by Richard Reynolds and Paul McGann to pursue emerging opportunities in Elephant and Castle for creating temporary community gardens and gathering spaces. 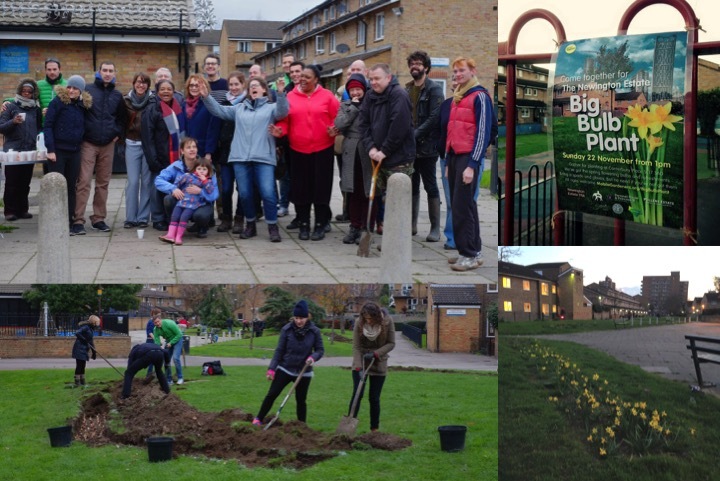 We recognised the value of gardening as a way of strengthening the community and improving even unremarkable and temporary opportunities in the landscape. Paul and Richard had met during campaigning for a progressive regeneration of the council’s Heygate Estate. Vast areas of the estate’s leafy public land were soon to be boarded up for a decade and the informal gardening and gathering activities in the estate would stop. Lend Lease, the council’s developer, was under growing pressure to make some dormant sites in the estate available until they were needed for construction – and in late 2011 eventually offered a small space for a meanwhile garden to the Elephant and Castle Urban Forest campaign which Richard had co-founded. The location Lend Lease chose was at the far end of a cul de sac on the south side of the Heygate Estate. Mobile Gardeners was created to take up this offer and create a space to share with the community. Negotiating with the council and Lend Lease for a lease to the land was challenging, they lacked any sense of enthusiasm to get the space in use but Richard and Paul reassured them of their credibility by becoming a Community Interest Company and including a Wansey St resident as a director and finding sharp pro-bono legal advice. 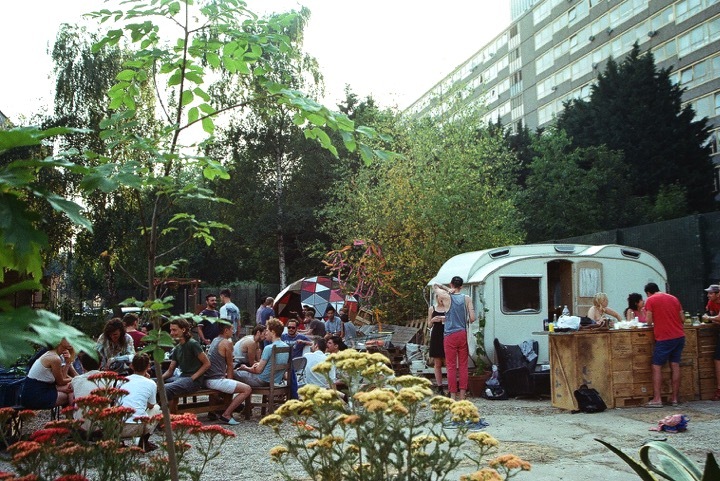 The “Mobile Gardeners Park” was a bleak location compared with almost every other piece of open space in the Heygate Estate, with barely any immediately cultivatable soil. The park began with just an expanse of crushed rubble, a few birch and buddleia near the edges but crucially plentiful sunshine and lots of space. It opened to visitors on 30 June 2012 (see Facebook photo album). 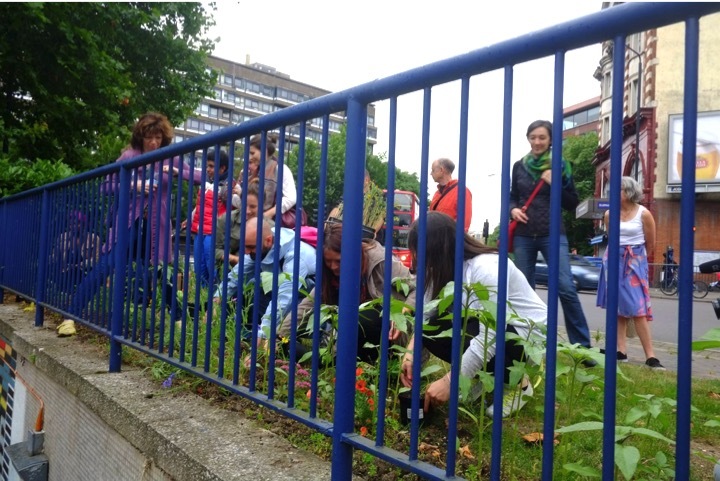 From this first base Mobile Gardeners activities grew across Elephant and Castle in the years ahead. Richard outlines of these Mobile Gardeners projects below. Our founding project was a daunting challenge but the place was gradually transformed into an incongruously beautiful place for people to “park and plant”. 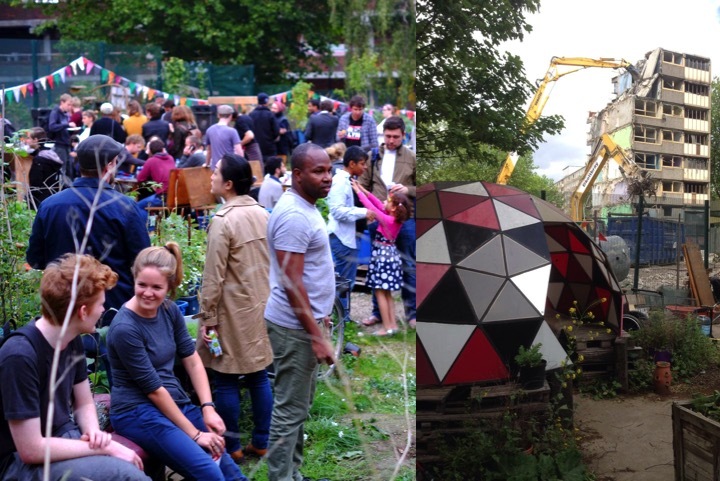 While the vast slab blocks and high level walkways of the adjacent Heygate Estate were torn down next to us we spent two years building a little park and welcoming in hundreds of visitors and signing up nearly a hundred local residents as free tenants. The video below charts the first two seasons months in 55 seconds. Paul zoned the site into rows of plastic tubs for tenant gardening, open entertainment space and a pictorial meadow sown in soil spread over rubble. Floral installations enlivened the space such as our Chesterfield ‘sofa bed’ and giant wheelie boxes recycled from a Mobile Gardeners display at the 2012 St George's Day fair in Trafalgar Square (see Facebook photo album). 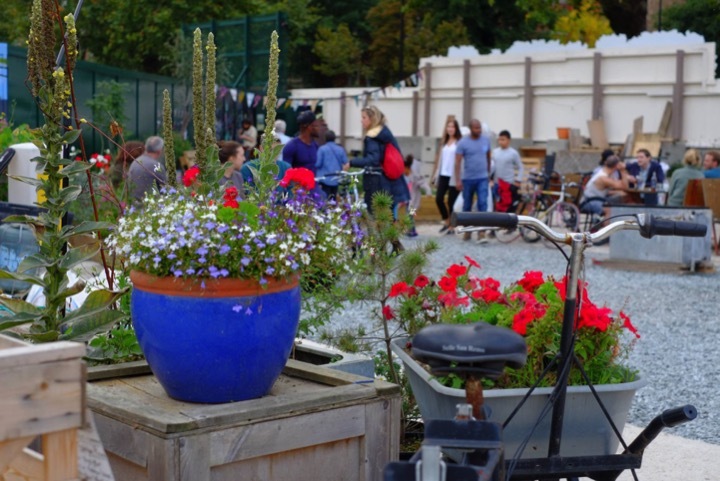 By competing for grant funding and by winning some, such as Southwark Council’s Cleaner Greener Safer, we afforded an old caravan, electricity generator, standpipe, gravel, a compost toilet, tools and most importantly truckloads of topsoil. Skilled workers from Lend Lease gave us a day of work at the start to help spread gravel and build a retaining wall. Andy Beauchamp built us a beautiful geodesic dome from scrap materials and we salvaged a truckload of old wooden pallets from a Chelsea Fringe installation. This timber was built into platforms for tubs, staging, seating and for festive bonfires. Locals donated old furniture and we salvaged other waste material from pop up commercial events. A trickle of interest in free tenancies grew into a more encouraging stream by spring 2013, each gardener contributing something beautiful or productive to the space and a welcome when there. As well as gardening we hosted live concerts, parties, BBQs, school visits, gardening workshops and a press launch for Kew’s Grow Wild campaign. We had two full seasons before Lend Lease regrettably pulled the plug in 2014, sooner than they had led us to believe when signing the lease. But it had been sufficiently enjoyable and viable that we pressed Lend Lease to provide us a new location so we could continue, which became The Plant Station (see below). 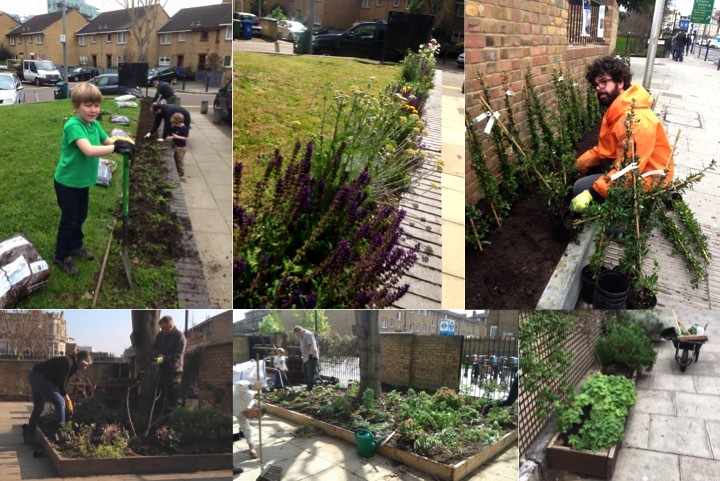 There are many photos of this project on the Mobile Gardeners Facebook, highlights include: June 2013, September 2013, October 2013, September 2014. The creation of the park was documented as part of the feature length film “Elephant Days” starring local band The Maccabees and released in 2015. Watch the trailer for the film on YouTube. After we left the park became a construction compound for several years. Today most of the park is now the newly extended Wansey Street with a wide verge to one side planted by Lend Lease. Local Siobhan Davies Dance studio put together Richard with Simon Whitehead a movement artist. The two of them devised The Mobile Meadow as a series of events during 2014 (see Facebook photo album). 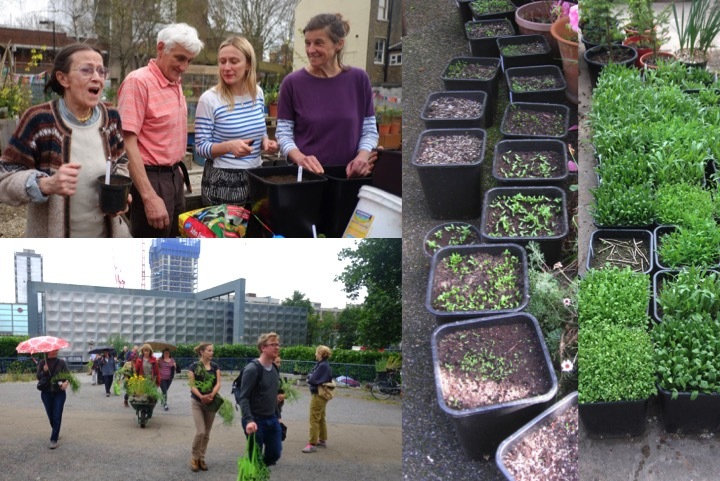 Residents were first invited in spring to events at the studio and Mobile Gardener’s Park to plant pots with wild flower seeds. 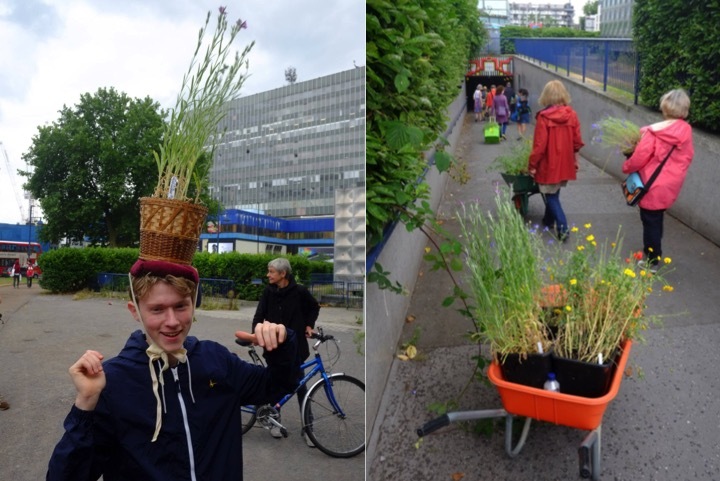 In June we gathered again for a walk around Elephant and Castle with our now floral pots, pausing along the way for improvisational movement and some guerrilla gardening at the centre of the Elephant and Castle Roundabout. We turned a few heads and raised awareness of the potential for wild flowers in the middle of a big city, whether in pots, verges, or in our park hidden at the far end of Wansey Street. Siobhan Davies Dance studio created three videos documenting this project. One is shown here, view the others on YouTube: Seeding Event and After Thoughts. For our second mobile garden we relocated to the other end of Wansey St, on the corner with busy Walworth Road (see Facebook photo album). What had once been a petrol station was now another field of rubble. This time it came with an unmetered tap and plenty of sunshine. Much of our previous park moved in autumn 2014. The geodesic dome was reconfigured to become a grand archway and the bar became a more important focal point, with a salvaged ‘tiki’ canopy. On being offered the site we anticipated the new location would make the project more visible and increase footfall, fulfilling our objectives better and generating an income from events and perhaps a café. It was uncomfortable relying on grant funding. But Lend Lease would not permit us to apply bold signage to the hoarding or cut big windows in it. So as before our park remained fairly hidden, a place to discover through word of mouth and social media. Some people found the Plant Station when passing as passengers on the top deck of a bus. We hosted another large party as part of the area’s annual Elefest, welcoming Jon Pandit from Asian Dub Foundation to DJ and Rainbow Collective to show their film Mass E Bhat. Guests brought donations for a local food bank. 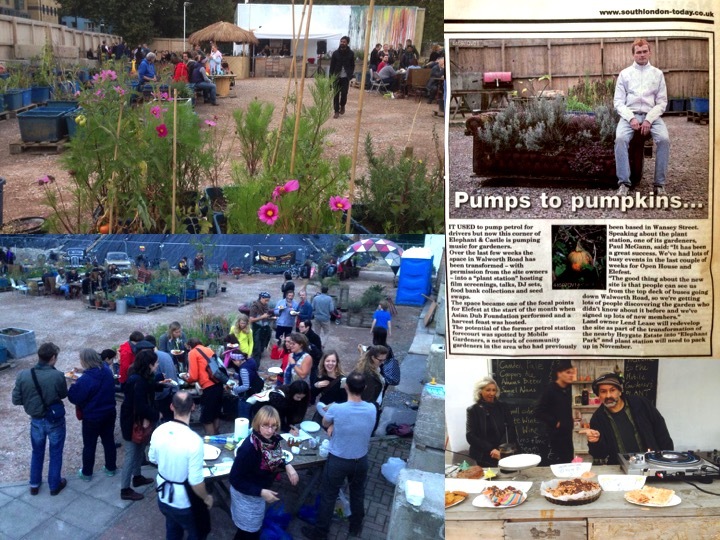 The popularity of parties and our success in getting an events licence from the council showed the potential for a growing emphasis on using the garden more as an entertainment space which could bring in funding and raise awareness. This became much more important in the next mobile park. Where would the garden move next we wondered? The Plant Station was always understood to be a short-term option. The offer from Lend Lease finally arrived in the form of a return to the heart of the Heygate Estate on the New Kent Road. As before the landscape was entirely concrete, on the footprint of the old blocks and garages rather than on any of the open ground. It was the biggest space by far. Paul was eager to take on the challenge once more, while Richard was more reluctant, disappointed by Lend Lease’s continued lack of enthusiastic commitment. It was as if Mobile Gardeners was something they had to suffer for a little while. We risked investing a lot of effort only for them to curtail the project prematurely again. We also saw potential in more community co-creation of public space in their final development, but this was anathema to them, their world was one of corporate landscapers and billing leaseholders for the upkeep of public space. Even the private gardens marketed to leaseholders by Lend Lease were sold with mature vegetables in them ready to pick, a ready meal bizarrely branded as a “grow garden”. Richard prioritised other Mobile Gardeners projects while and Paul took the lead with Grow Elephant and in 2015 threw himself into scaling it up and eventually running it independently (see Facebook photo album). The tenant gardens, our old compost loo and even the Chesterfield sofa bed made the move. Paul secured significant new funding for an all weather hub made from a shipping container and salvaged doors and windows. It housed a kitchen, a piano and lots of comfy old furniture. Richard lined up Giff Gaff who made a big financial contribution and gave us a crowd of enthusiastic staff to be painters and gardeners for an afternoon, beautifying the fences and ornamental borders. We were even donated Roy, a cat, who lived in the shipping container. Lend Lease let us design a large branded hoarding for the entrance, but it was short lived when they had to chop through it to install their miscalculated entrance to the garden! Paul organised several visits from students at the local Globe Academy and St John’s Primary School. By 2016 the emphasis had shifted away from tenant gardening and the space had evolved into becoming an entertainment space with the new Tropics Cafe welcoming in passers by during the day and a variety of popular dance events taking place by night. Lend Lease closed the project earlier than expected after just two summers. Paul pursued a new fourth location at Elephant and Castle, but settled on a move across the river to make Grow Tottenham. The Draper Estate on Newington Butts comprises all sorts of different open spaces from the verges of playgrounds to raised lawns, courtyards and huge very public tree-lined lawns facing the ring road (see Facebook photo album). The estate has also had a tremendously entrepreneurial residents association who sought out Mobile Gardeners to bring skills and enthusiasm to gardening on the estate above and beyond the basic mowing of lawns and hacking of shrubs provided by the council cleaning team. Paul kicked off the collaboration with some bulb planting in the huge compacted triangular lawn on Newington Butts and by rejuvenating some of the courtyard’s beds. Richard continued the work by leading regular gardening sessions organised by association member Susan Vericat. Over three years many corners of the estate were transformed from half-day sessions of communal gardening. A wide variety of ornamental planting has thrived, herbaceous borders, climbers up old fences, fragrant bulbs and a new hedge. 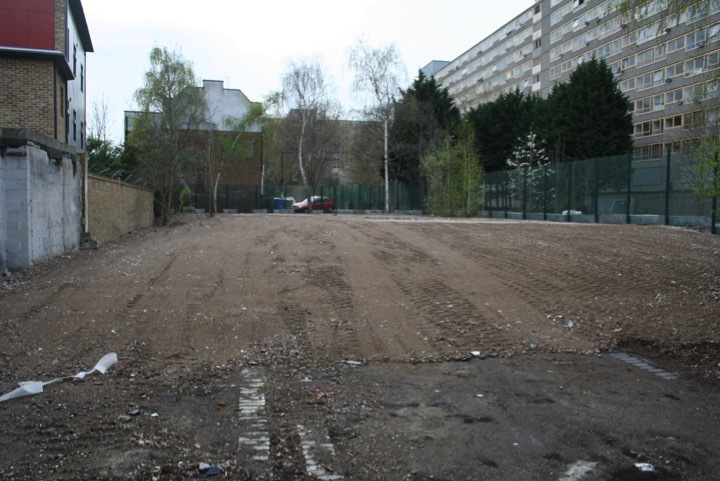 Sadly, beyond the initial bulb planting on the estate’s large grassy triangle facing Newington Butts, we were not involved in the re-landscaping of that area in 2016 and the feedback the association asked of us in response to the proposals were unfortunately entirely ignored by Southwark Council. Despite the triangle's huge budget for creation and first year maintenance it has rapidly become a messy blight on the local area. Nevertheless the areas of the Draper Estate we worked on have been adopted by a few core resident enthusiasts and matured into simple and pretty patches to tend. 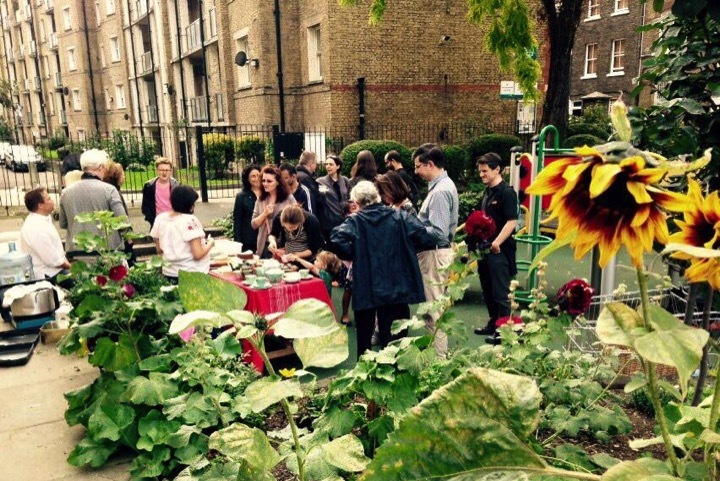 On the edge of Southwark Council's Hayles Estate at the corner of Elliott’s Row and St George’s Road is a small-gated park and playground open to the public 24 hours a day that has flourished since 2012 as a revitalised pocket park (see Facebook photo album). The original park had been created from waste ground in the late early 2000s but had then been inadequately maintained to become overgrown, foreboding and unwelcoming. Ivy had been left to rampage up the tall robinia trees and all over a large pergola. A homeless man was found there dead. In winter 2012 I began some tentative guerrilla gardening by clearing a bit of undergrowth and planting some daffodils. These flourished and over the following nine months I did a little more including as a flash mob of tulip bulb planters with funding from Elefest. A chance encounter with a neighbour while I was guerrilla gardening a nearby tree pit was the trigger to be more ambitious with the park. Beverly McFarlane was both a keen gardener and enthusiastic about the parks’ potential. She offered to help fundraise. I made overtures to the council about taking the lead with volunteers tending the space, which their cleaning and estate team approved - there is no contract. I invited to estate’s resident’s association to work together on it. 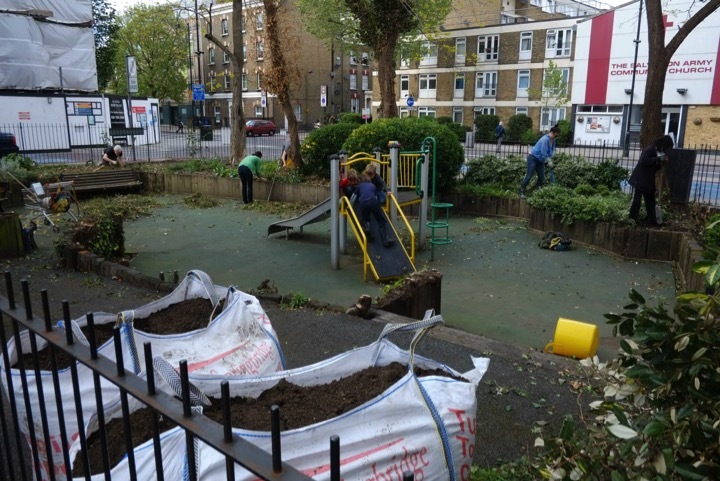 Until this point a few residents had pursued anti-social issues in the park but the their association had been uninterested in investing in the park and were focused on creating a more secluded new gardening area within Lamlash Street. They were happy to support and help administer an application for £1950.34 from the Co-op Bank’s Local Community Fund, which we were awarded at the end of 2013 all of which paid for materials to enrich the open ground, replant, clear the ivy and put up welcoming signage to present the space more clearly as a public park – the council has only ever provided warning notices about dogs. We also bought an enormous industrial-grade hosepipe that was essential to keep the garden damp given the thick tree canopy above the plants. 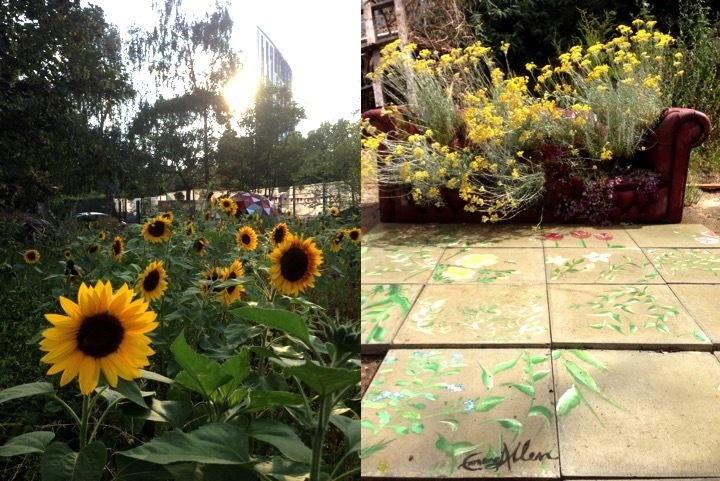 In summer 2014 we succeeded in getting a £1,000 grant from Grow Wild to pay for a mural celebrating wild flowers. Our national competition for the design was won by Sheilagh Jevons in Shropshire but she sadly passed away before painting it and so the project was realised by London-based artist Marc Craig. 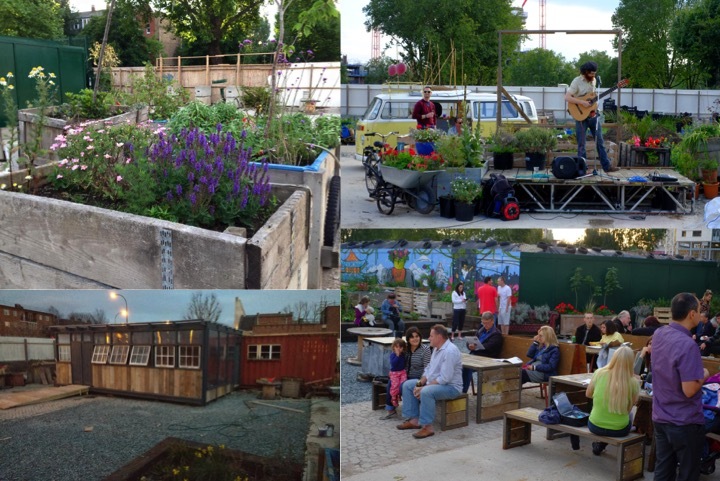 In 2015 we successfully received funding of £1972.44 from Southwark Council’s Cleaner Greener Safer budget that we spent on large steel containers to extend and deepen the planting area as well as copious sacks of manure to enrich the soil, two thick top dressings every year. The park has flourished. It appears much more popular both with parents of young children as well as people just looking for a pretty place to take a seat or do some yoga. We have hosted an annual tea party in the space and used it for children’s birthday parties. Local residents Daniel and Nelle have become crucial to the ongoing care of the space. This project has no likely end point unless the council build on it or the volunteering ceases. Its location next to a busy red-route, cycle superhighway and bus stops enables it to provide a substantial public benefit of beautifying the streetscape on top of the enjoyment that comes from stepping inside. A note on changes in 2018: Soon after taking on the management of the space we requested the council fell one of the robinias because it appeared to us as very damaged by ivy. The ground out the roots and we planted a beautiful Cornus “Wisley Queen” in its place. In the winter of 2016 another robinia that had been weakened by ivy crashed down in a storm. The council then inspected the remaining four trees and concluded they all needed felling. This took place in June 2018. They have met with myself, Nelle and Daniel to plan which species are planted to replace them, which we expect will take place in winter 2018. Visit the Elliott's Row Pocket Park website. Elliott’s Row Pocket Park features in the substantial book Compendium of Landscape Architecture published in 2017. Despite the closure of our first Mobile Gardeners Park at the far end of Wansey Street for use as a construction compound, we identified that a small corner might still be retainable. In 2013 we had added this little space onto our park by demolishing a rickety old fence that marked our border and clearing away the undergrowth and fly tipping within (see Facebook photo album). It was a patch of land at the end of the adjacent terrace that was missing off our lease. The soil and pathway chippings needed to make it habitable were funded with a little Mayoral ‘clean up’ money. So when Lend Lease closed our park we persuaded them to let us have this little corner. They installed a gate and redirected the water supply. Richard took the lead in developing this space into a colourful little garden and play space producing a good crop of apples, pears and strawberries. He collaborated with design students from Camberwell College of Art who in 2014 created seating, tables and a wall for chalk murals. Lend Lease closed this garden in September 2016, though a little of the planting survived their landscaping and thrives today. 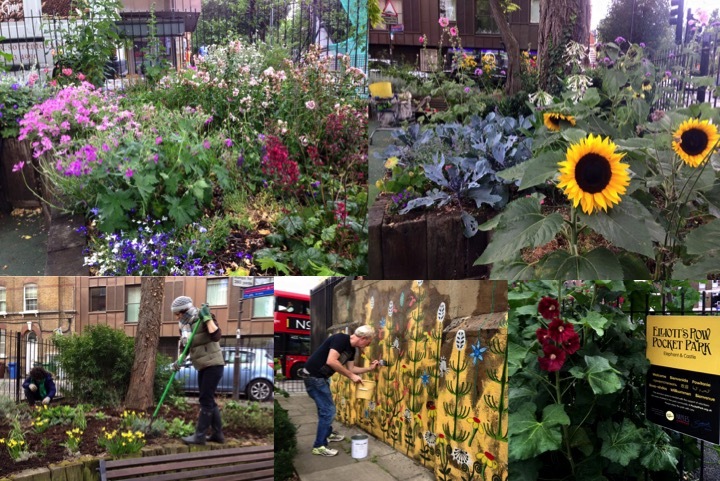 Paul had been working with residents of the Newington Estate in spring 2015 (see Facebook photo album) to rejuvenate some planters by their hall. Following a murder of a young boy within the estate grounds in September several local residents expressed a desire for a positive action of memorial within the estate. 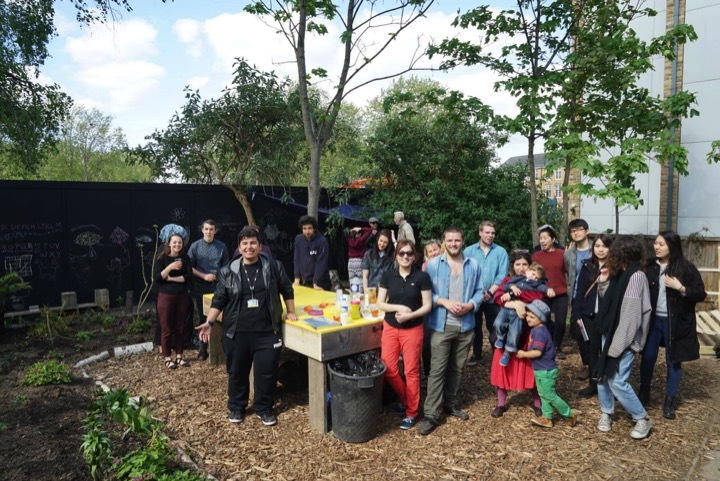 By collaborating with residents from adjacent estates, United St Saviour’s charity, Southwark Council and developer Lend Lease Mobile Gardeners delivered the marketing, organisation and led the gardening on the day. About fifty people planted three thousands daffodil bulbs in swathes across the estate on 22 November 2015. 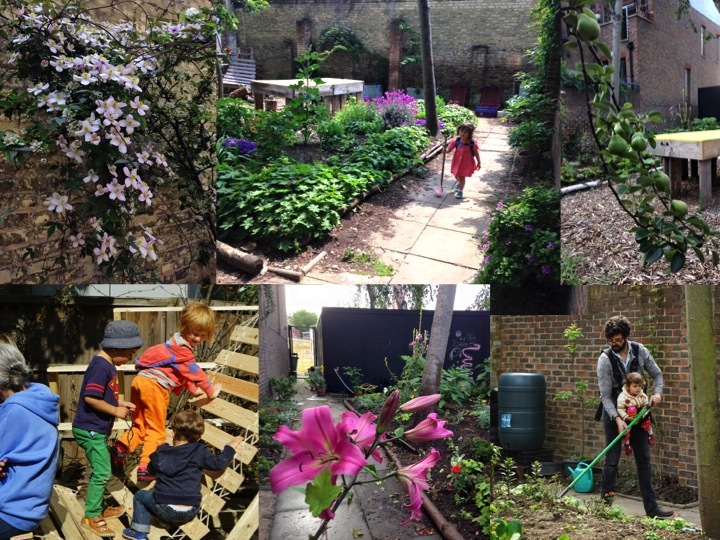 Mobile Gardeners has also worked with the Pullens Estate, Brandon Estate, Rockingham Estate, Ark Globe Academy, Hughes House and Paper Works. Paul McGann is currently running Grow Tottenham and is still also involved in some projects around Elephant and Castle as Grow Elephant. Richard Reynolds maintains an interest in Elliott's Row Pocket Park with Mobile Gardeners and is also an activist gardener as founder of GuerrillaGardening.org.